Robert Landers competes in the discus. Robert Landers releases the discus. The 4×100 relay placed fourth. Robert Landers competes in the shot put. Robert Landers receives the fifth place medal in the shot put. Madison Doss competes in the 400-meter dash. Damon Roberts competes in the 300-meter hurdles and had the 14th fastest time in the prelims with a 39.806. Damon Roberts competed in the 300 hurdles. COLUMBUS — Three members of the Wayne track teams placed at the state track meet held at The Ohio State University on Friday and Saturday. Wayne’s 4×100 relay, composed of Alonzo Johnson, Hadith Tiggs, Tyree Kinnel and Ahmad Wagner, ran a 42.26 on Saturday to place fourth. They ran a 42.28 in the prelims on Friday. Madison Doss placed fifth in the 400-meter dash with a 56.26. 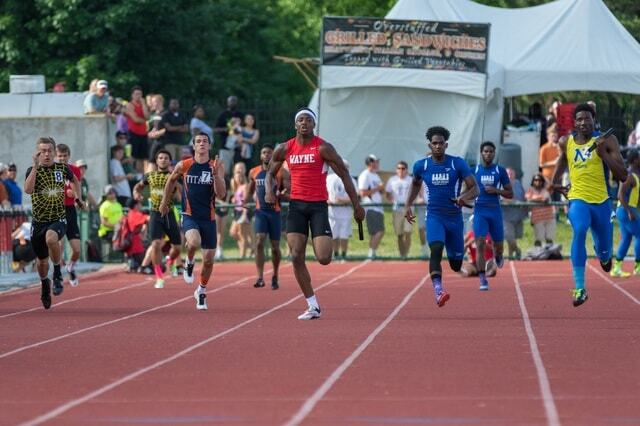 The Wayne junior ran a 56.49 in the prelims. Robert Landers took fifth place in the state shot put with a throw of 59-8. He also took 13th place in the discus with a release of 148-0. In the team race, the Wayne boys tied for 29th with nine points while the girls tied for 43rd with four points.